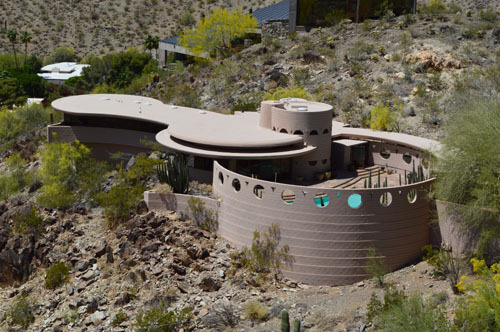 Designed by Frank Lloyd Wright in 1959, it was to be his last residential work. As John Rattenbury describes it, "After studying the topographic map, Wright set it aside for a while and worked on other projects. He always allowed an idea to germinate before committing to it to paper. The next morning he quickly sketched a plan on the map... With a panoramic view in mind, and considering the shape of the natural plateau, he drew two overlapping circles... After a while, Wright got up from his desk and walked out of the studio. He never returned. The next day he was in the hospital with an intestinal problem..." A Living Architecture, Rattenbury, 2000, p.247-250. 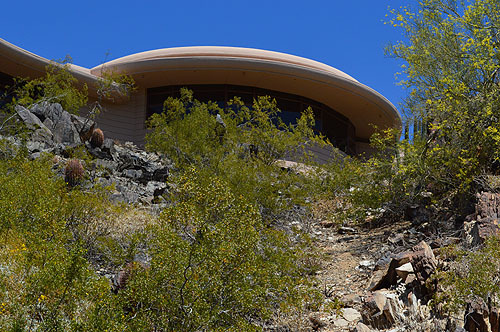 Working drawings were completed in 1966 by Taliesin Fellow, John Rattenbury, who had worked closely with Mr. Wright on the initial plans. Rattenbury also supervised the construction of the home. 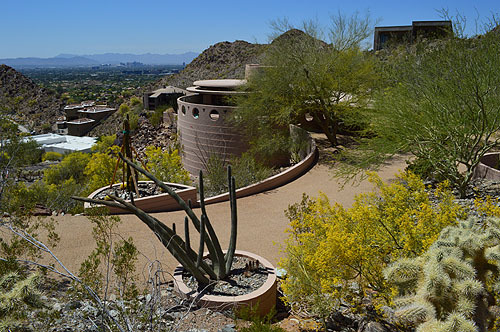 The home is dramatically built into the hillside, overlooking Phoenix and the valley. 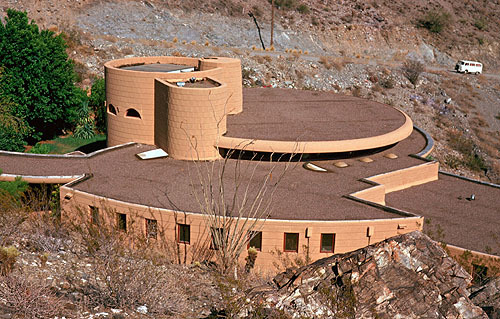 Based on intersecting and overlapping circles, the home is over 2800 square feet. 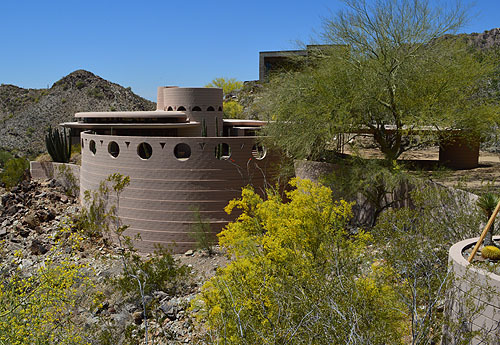 The circular design is constructed of desert-rose tinted concrete blocks. The interior is finished with Philippine mahogany. A covered walkway leads from the circular drive, around the exterior wall of the circular Garden Court, to the entrance of the home. Two steps down leads into the circular living room. From the Entry, five steps up leads to the bedroom wing. 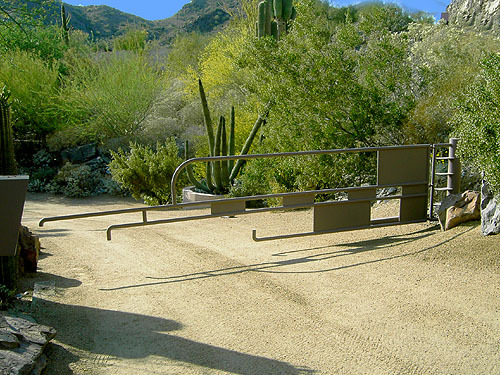 In 1993, John Rattenbury oversaw a remodel for a new owner. The fourth bedroom was combined with the Master bedroom, and two other bedrooms were combined to create a larger guest room, reducing five to three. The spiral staircase adjacent to the workspace that lead down to a workshop under the Living Room was converted to a home theater. The first opportunity to view this home was April 2004. Our second opportunity was ten years later in April 2014. Floor Plan courtesy of William Storrer, adapted by Douglas M. Steiner. 1) Lykes Residence Garden Court and Terrace viewed from the North from the exterior side of the Garden Court wall. The fountain is on the left, the Living Room is in the center, the Workspace is on the right. The Terrace is in the foreground. Photographed by William Storrer. Courtesy of the Oak Park Public Library. 2) Lykes Residence Living Room viewed from the South. 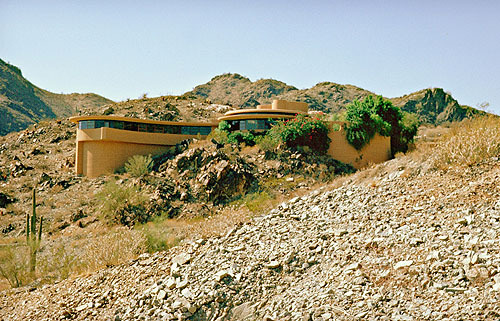 John Rattenbury worked with Wright on the initial plans for the home. 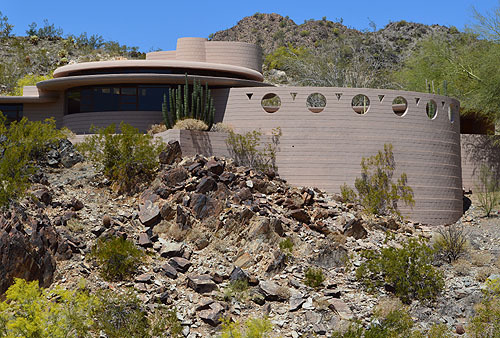 According to Rattenbury, a few days before his death, Wright sketched out the plans for the home, set them aside, but never was able to returned to them, due to his death. Rattenbury completed the working drawings and specifications in 1966. Construction took place on the home for the next two years. He designed the furniture and built-ins, adapted from the original plans created by Wright before his death. The bi-fold doors on the left leads to the workspace which is located behind the fireplace. The doors on the right leads to the Garden Court. The table and hassock/chairs are on the right. 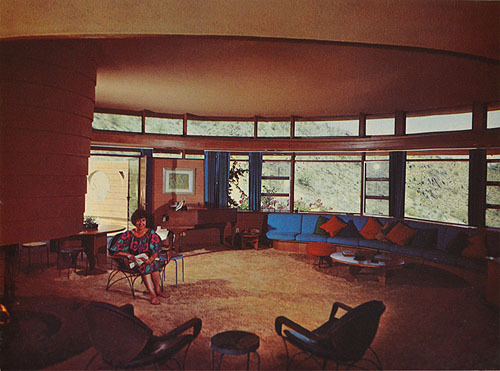 Appears to be taken before curtains were installed in the Living Room, visible in the 1970 image. Photographed by William Storrer. Courtesy of the Oak Park Public Library. 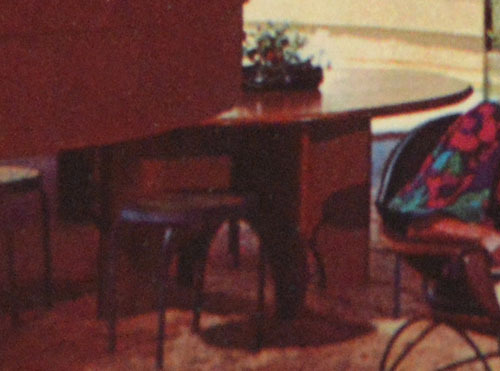 2A) Detail of the Lykes Residence Dining Room table and chairs. 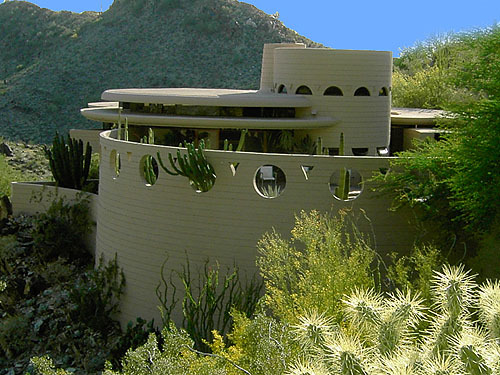 According to John Rattenbury, a few days before his death, Wright sketched out the plans for the home, set them aside, but never was able to returned to them, due to his death. Rattenbury completed the working drawings and specifications in 1966. Construction took place on the home for the next two years. Rattenbury designed the furniture and built-ins, adapted from the original plans created by Wright before his death. 3) Lykes Residence Workspace. 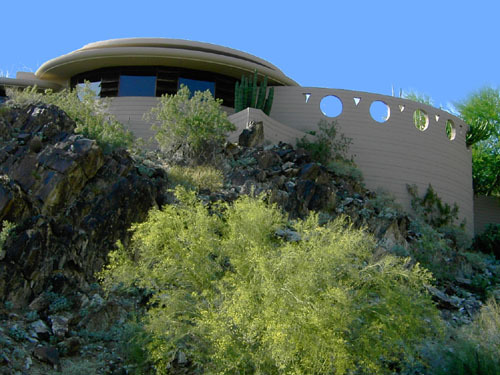 John Rattenbury worked with Wright on the initial plans for the home. 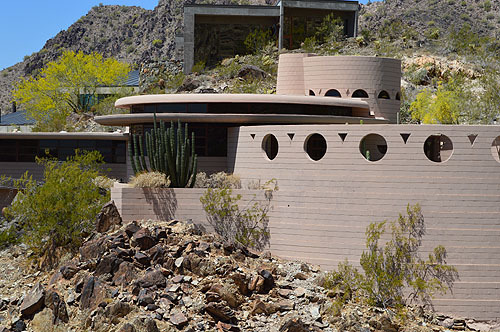 According to Rattenbury, a few days before his death, Wright sketched out the plans for the home, set them aside, but never was able to returned to them, due to his death. Rattenbury completed the working drawings and specifications in 1966. Construction took place on the home for the next two years. He designed the built-ins, adapted from the original plans created by Wright before his death. Cabinets are constructed of Philippine mahogany. Photographed by William Storrer. Courtesy of the Oak Park Public Library. 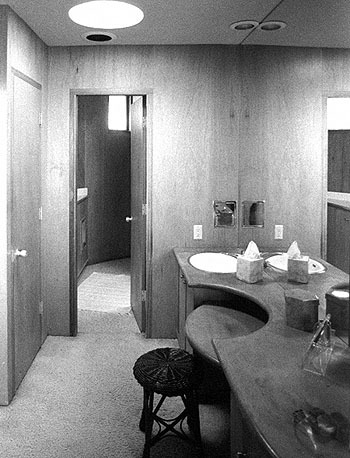 4) Lykes Residence Master Bath. 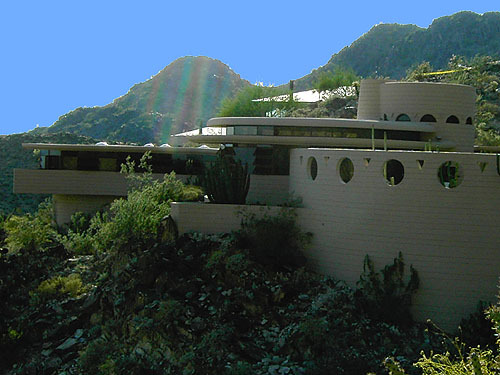 John Rattenbury worked with Wright on the initial plans for the home. 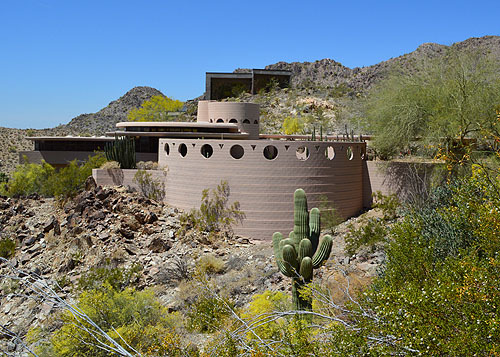 According to Rattenbury, a few days before his death, Wright sketched out the plans for the home, set them aside, but never was able to returned to them, due to his death. Rattenbury completed the working drawings and specifications in 1966. Construction took place on the home for the next two years. 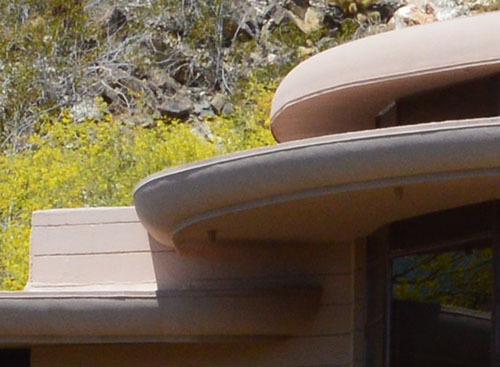 He designed the built-ins, adapted from the original plans created by Wright before his death. Walls are covered with, and the cabinets are constructed of, Philippine mahogany. Photographed by William Storrer. Courtesy of the Oak Park Public Library. Lykes Residence Living Room viewed from the study. The fireplace is on the far left. The exit to the Garden Court is on the left behind Aime Lykes. Built-in seating under the windows are on the right. 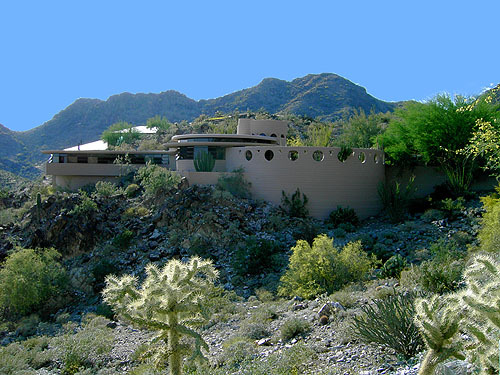 John Rattenbury worked with Wright on the initial plans for the home. 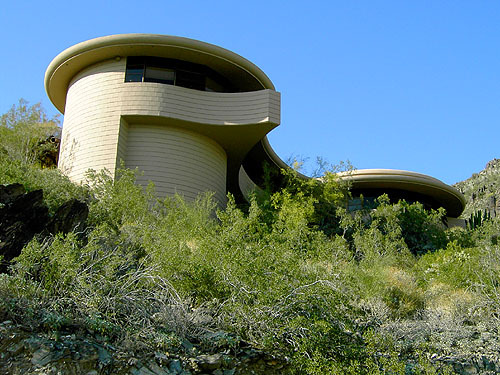 According to Rattenbury, a few days before his death, Wright sketched out the plans for the home, set them aside, but never was able to returned to them, due to his death. Rattenbury completed the working drawings and specifications in 1966. He designed the furniture and built-ins, adapted from the original plans created by Wright before his death. The round Dining Room table is on the left. A small round end table is in the center. A hassock and coffee table is on the right. Photographed by Neil Koppes. 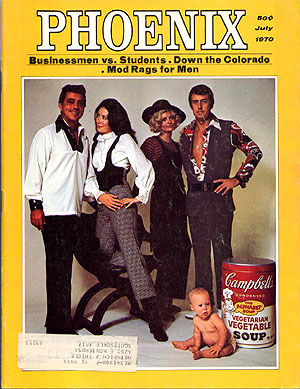 Published in "Phoenix", July 1970, p.55. Detail of the round Lykes Residence Dining Room table. Detail of the Lykes Residence hassock and coffee table. 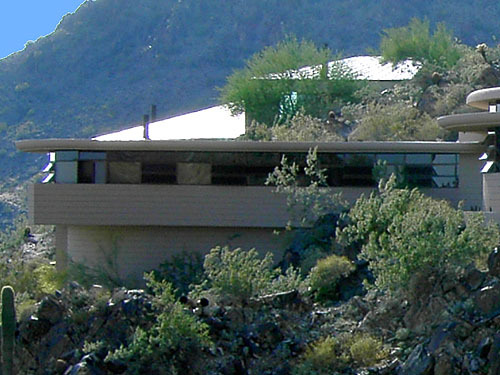 Aime and Norman Lykes Residence viewed from the Southeast, 1975. The Bedroom wing is on the left. The Master Bedroom is on the far left, four additional Bedrooms are between the Master Bedroom and the Living Room. The Living Room is in the center. Clerestory windows cast indirect lighting into the Living Room. 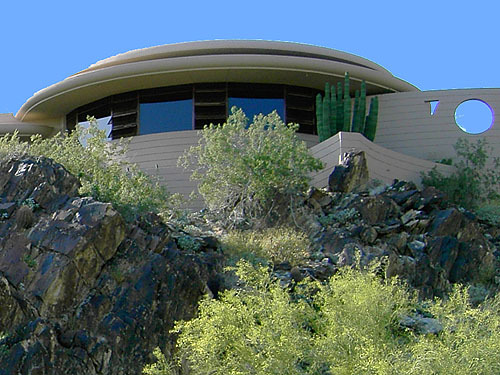 Frank Lloyd Wright formed the home around the rock outcropping he wanted to preserve. The Garden Court on the right. Courtesy of, and photographed in November 1973 by Anthony Thompson. 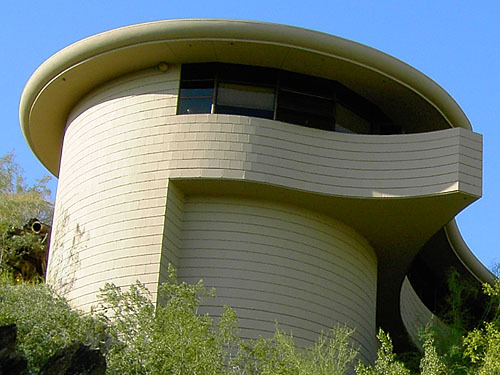 Aime and Norman Lykes Residence viewed from the West, 1975. The Shop and Utilities rooms are in the foreground. The covered walkway and Garden Court is on the left. The Workspace (Kitchen) and Living Room is in the center. The Bedroom wing is to the right. Courtesy of, and photographed in November 1973 by Anthony Thompson. 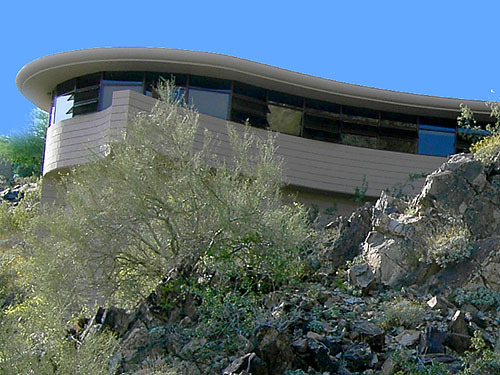 Set of ten images of the exterior Lykes Residence photographed on April 26, 2004. 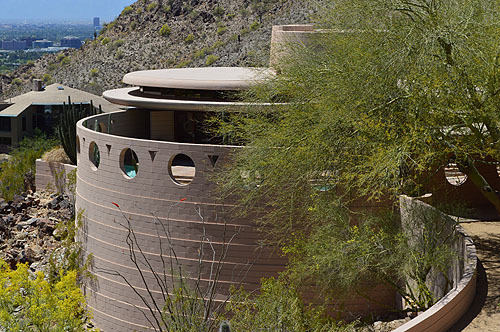 Designed by Frank Lloyd Wright in 1959, it was to be his last residential work. 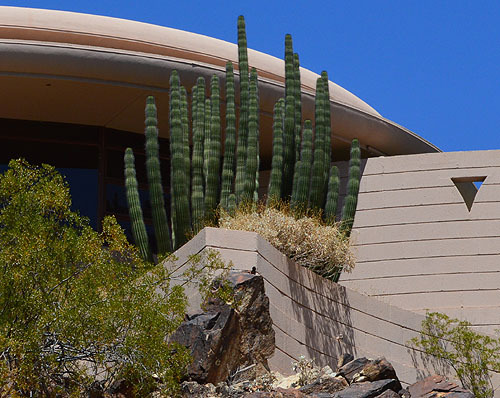 Working drawings were completed in 1966 by Taliesin Fellow, John Rattenbury, who had worked closely with Mr. Wright on the initial plans. Rattenbury also supervised the construction of the home. 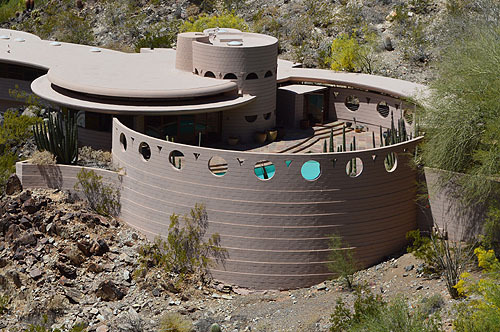 Based on intersecting and overlapping circles, the home is over 2800 square feet. 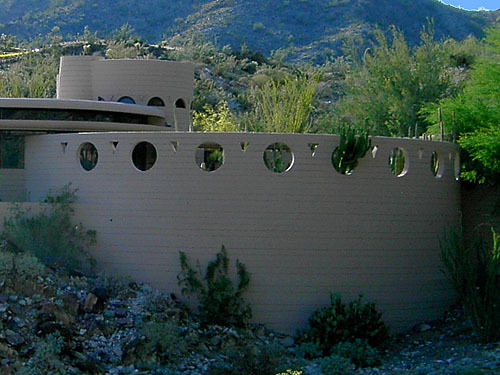 The circular design is constructed of desert-rose tinted concrete blocks. 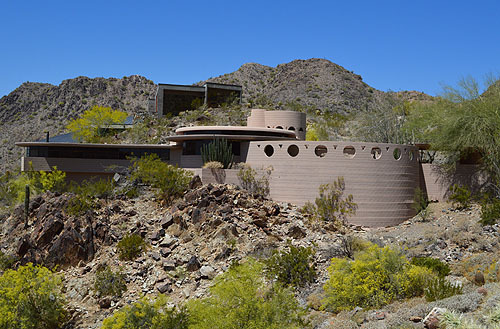 The home is dramatically built into the hillside, overlooking Phoenix and the valley. 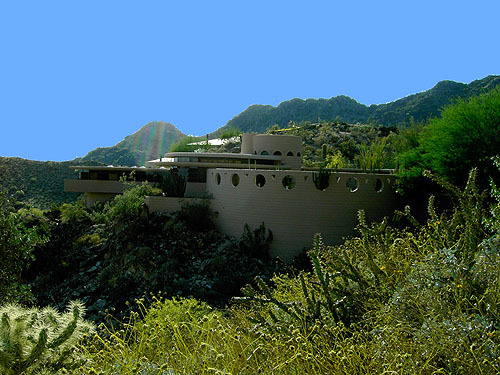 As we approach the home it is viewed from below and reached by a steep hill on the East side of the property. 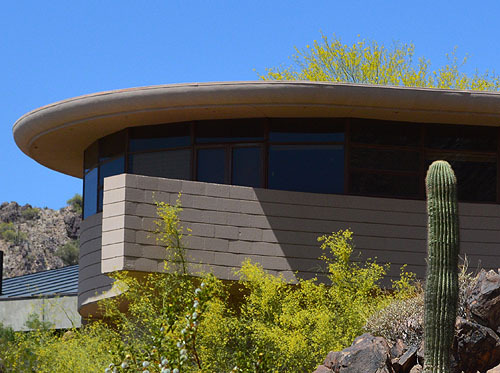 Aime and Norman Lykes Residence, 2014 (1959 - S.433). Set of eighteen images of the exterior Lykes Residence photographed on April 17, 2014. 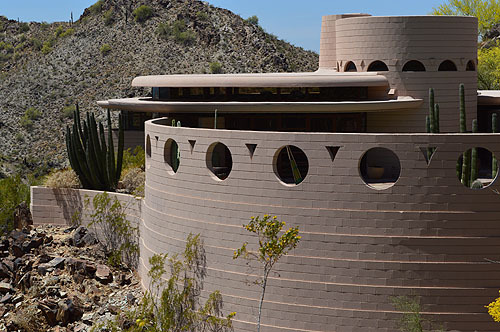 Designed by Frank Lloyd Wright in 1959, it was to be his last residential work. 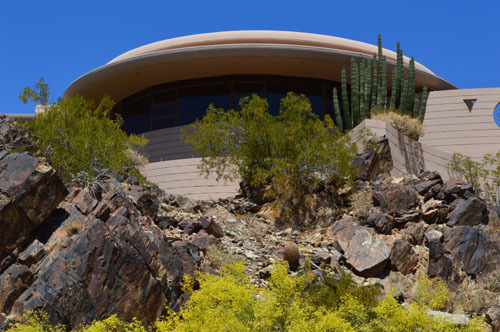 Working drawings were completed in 1966 by Taliesin Fellow, John Rattenbury, who had worked closely with Mr. Wright on the initial plans. Rattenbury also supervised the construction of the home. 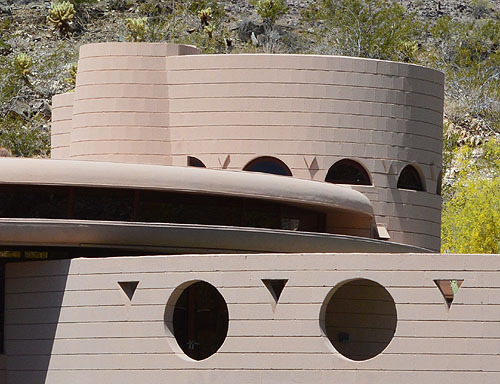 Based on intersecting and overlapping circles, the home is over 2800 square feet. 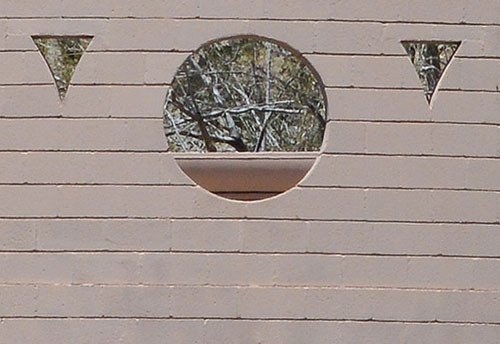 The circular design is constructed of desert-rose tinted concrete blocks. 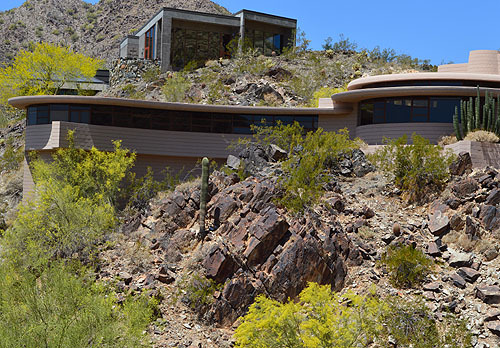 The home is dramatically built into the hillside, overlooking Phoenix and the valley. 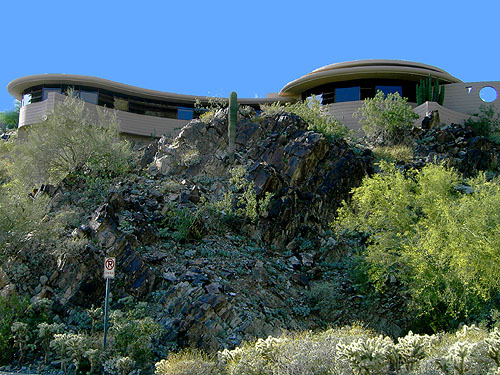 As we approach the home it is viewed from below and reached by a steep hill on the East side of the property. 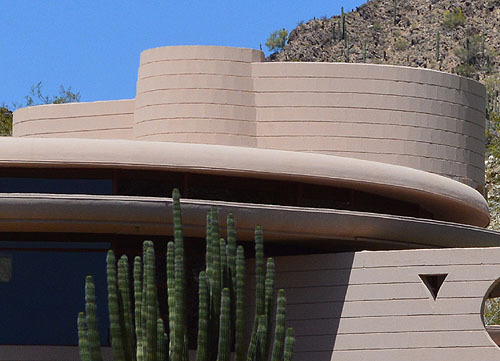 During this trip to Scottsdale, we had more time to photograph the exterior this home than ten years earlier. 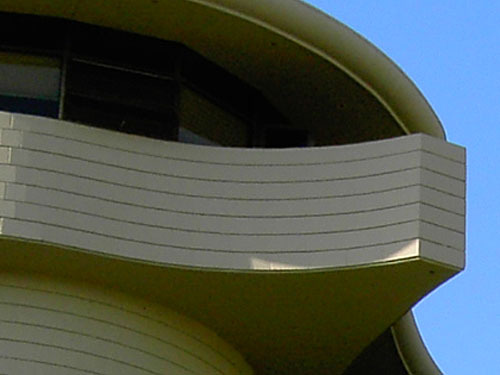 The Master Bedroom Balcony is cantilevered, and formed by two intersecting circles. The built-in planter, although separated from the bedroom wing by the living room, still follows the curvature of the bedroom wing. 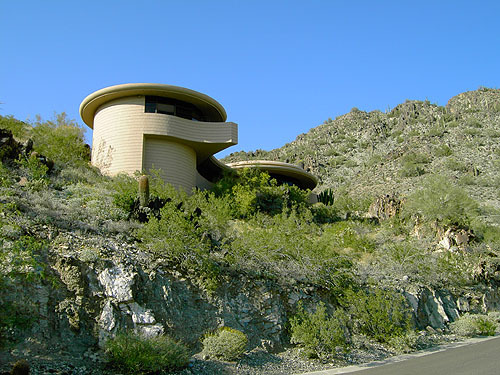 Wright adapted his designs to the landscape. Colors blend. 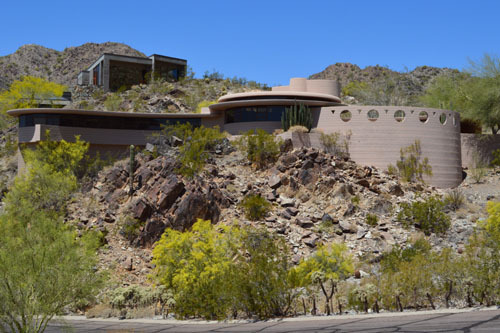 He formed the home around a major rock outcropping he wanted to preserve. 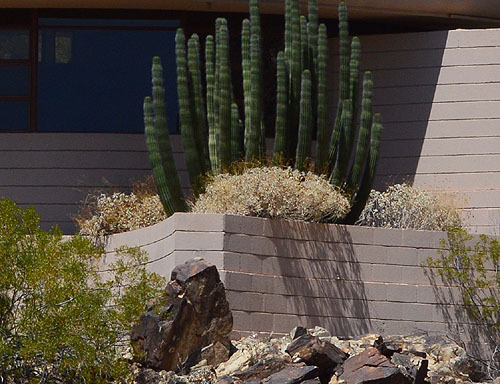 Stereotypical of Wright homes, it appears to "grow" from the landscape. 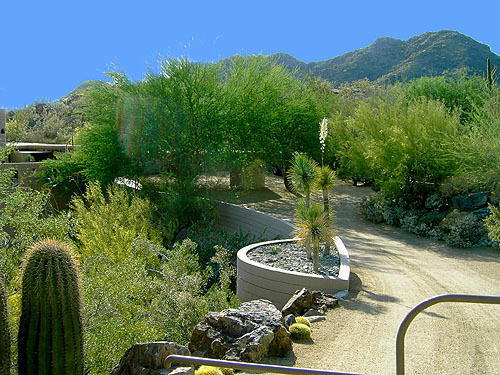 Built-in planters blend the natural landscaping of the property with the home. Wright designed clerestory windows to bring natural soft indirect light into the Living Room. 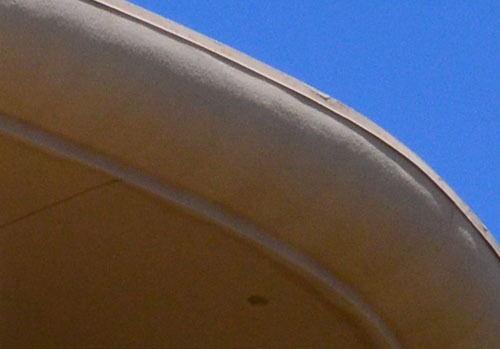 The roof above the clerestory windows appears to float on glass. 1) Detail of the Lykes Residence Dining Room table and chairs. 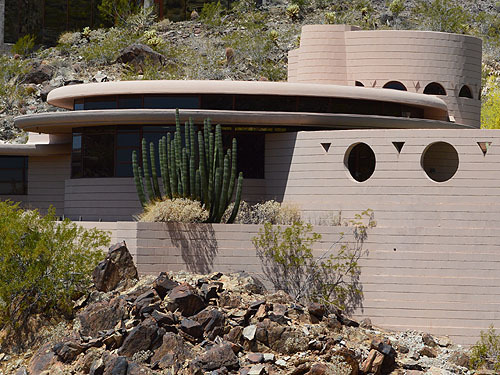 According to John Rattenbury, a few days before his death, Wright sketched out the plans for the home, set them aside, but never was able to returned to them, due to his death. Rattenbury completed the working drawings and specifications in 1966. Construction took place on the home for the next two years. Rattenbury designed the furniture and built-ins, adapted from the original plans created by Wright before his death. Photographed by William Storrer, circa 1968. Courtesy of the Oak Park Public Library. 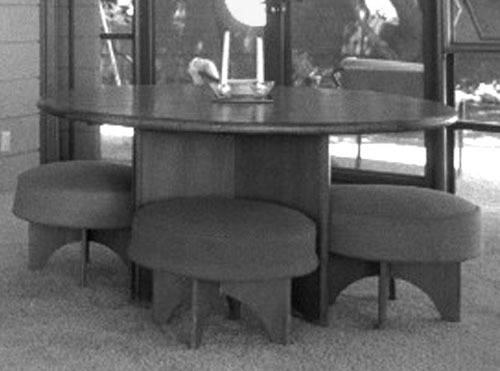 2) Detail of the round Lykes Residence Dining Room table. 3) Detail of the Lykes Residence hassock and coffee table. Title: Aime and Norman Lykes Residence Garden Court and Terrace, Circa 1968 (1959 - S.433). Description: Lykes Residence Garden Court and Terrace viewed from the North from the exterior side of the Garden Court wall. The fountain is on the left, the Living Room is in the center, the Workspace is on the right. The Terrace is in the foreground. Photographed by William Storrer. Courtesy of the Oak Park Public Library. 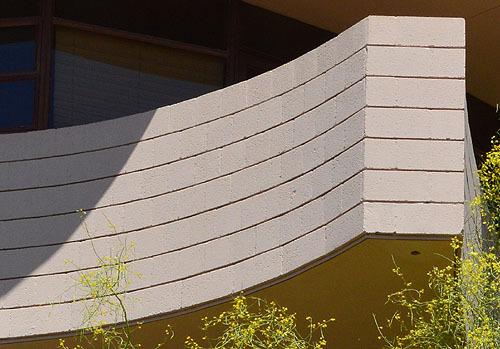 See our Wright Study on the Lykes Residence. Size: 10 x 6.75 Color photograph. 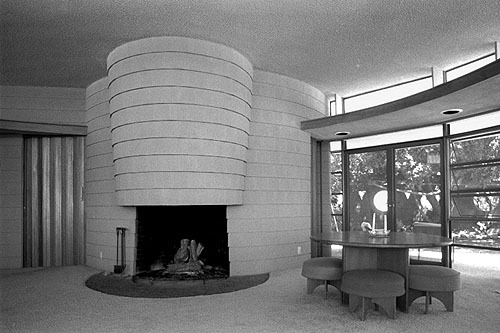 Title: Aime and Norman Lykes Residence Living Room, Circa 1968 (1959 - S.433). Description: Lykes Residence Living Room viewed from the South. 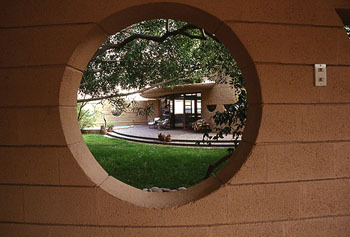 John Rattenbury worked with Wright on the initial plans for the home. 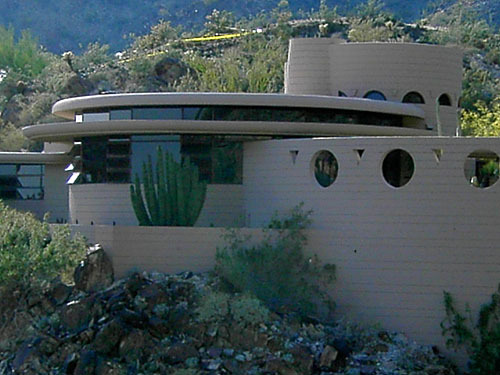 According to Rattenbury, a few days before his death, Wright sketched out the plans for the home, set them aside, but never was able to returned to them, due to his death. Rattenbury completed the working drawings and specifications in 1966. Construction took place on the home for the next two years. He designed the furniture and built-ins, adapted from the original plans created by Wright before his death. The bi-fold doors on the left leads to the workspace which is located behind the fireplace. The doors on the right leads to the Garden Court. The table and hassock/chairs are on the right. 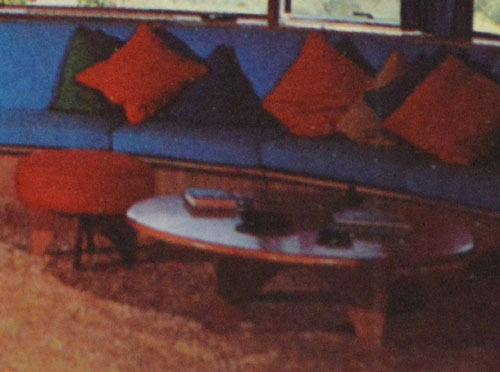 Appears to be taken before curtains were installed in the Living Room, visible in the 1970 image. Photographed by William Storrer. Courtesy of the Oak Park Public Library. 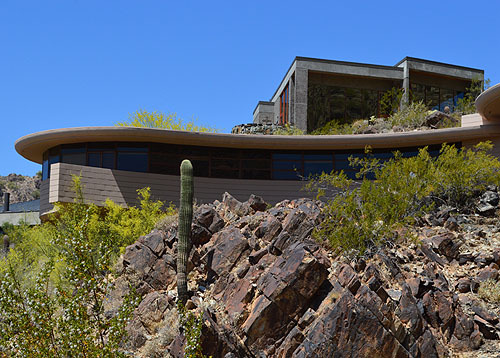 See our Wright Study on the Lykes Residence. Size: 10 x 6.75 B&W photograph. 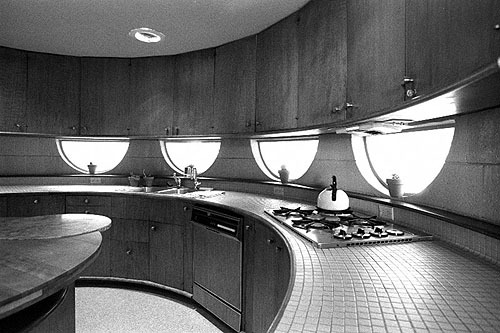 Title: Aime and Norman Lykes Residence Workspace (Kitchen), Circa 1968 (1959 - S.433). Description: Lykes Residence Workspace. 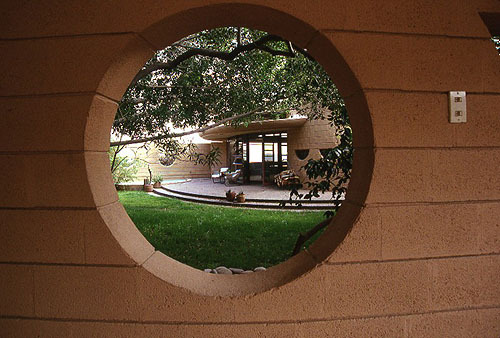 John Rattenbury worked with Wright on the initial plans for the home. 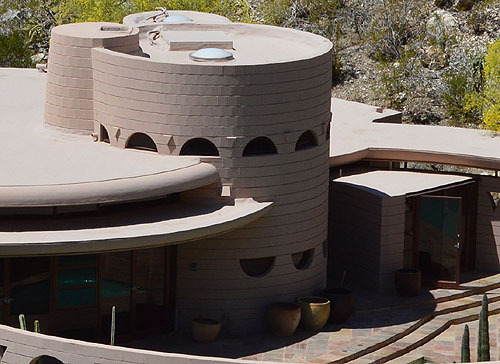 According to Rattenbury, a few days before his death, Wright sketched out the plans for the home, set them aside, but never was able to returned to them, due to his death. Rattenbury completed the working drawings and specifications in 1966. Construction took place on the home for the next two years. He designed the built-ins, adapted from the original plans created by Wright before his death. Cabinets are constructed of Philippine mahogany. Photographed by William Storrer. Courtesy of the Oak Park Public Library. See our Wright Study on the Lykes Residence. Title: Aime and Norman Lykes Residence Master Bath, Circa 1968 (1959 - S.433). Description: Lykes Residence Master Bath. 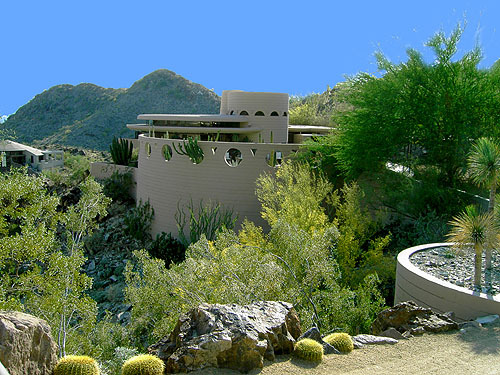 John Rattenbury worked with Wright on the initial plans for the home. 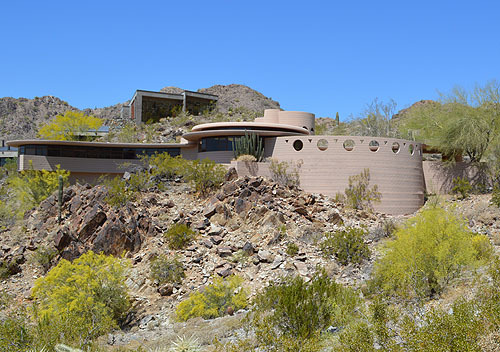 According to Rattenbury, a few days before his death, Wright sketched out the plans for the home, set them aside, but never was able to returned to them, due to his death. Rattenbury completed the working drawings and specifications in 1966. Construction took place on the home for the next two years. He designed the built-ins, adapted from the original plans created by Wright before his death. Walls are covered with, and the cabinets are constructed of, Philippine mahogany. Photographed by William Storrer. Courtesy of the Oak Park Public Library. See our Wright Study on the Lykes Residence. 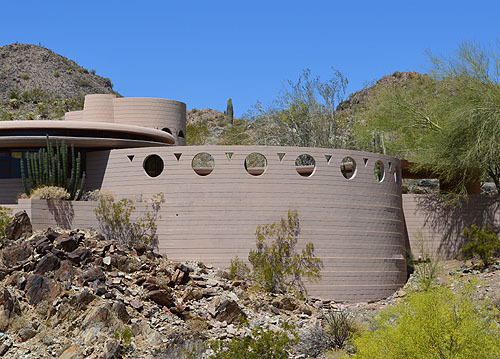 Description: Frank Lloyd Wright�s Circular Sun House. Lykes House. (Sweeney 1828) See our Wright Study on the Lykes Residence. Title: Aime and Norman Lykes Residence Living Room, 1970 (1959 - S.433). Description: Lykes Residence Living Room viewed from the study. The fireplace is on the far left. The exit to the Garden Court is on the left behind Aime Lykes. Built-in seating under the windows are on the right. 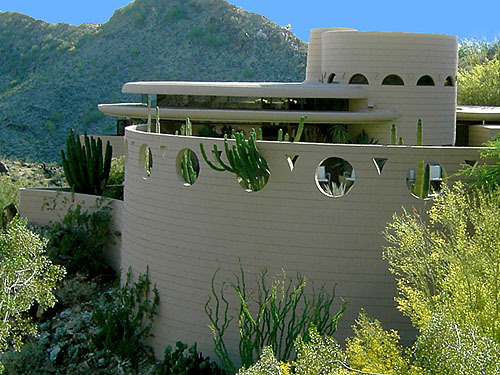 John Rattenbury worked with Wright on the initial plans for the home. 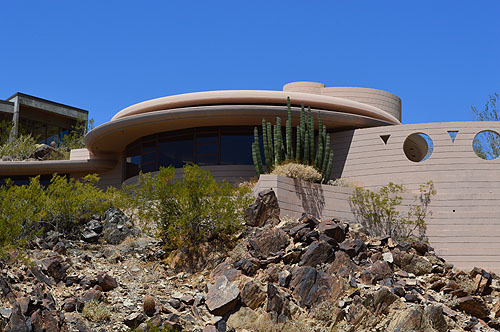 According to Rattenbury, a few days before his death, Wright sketched out the plans for the home, set them aside, but never was able to returned to them, due to his death. Rattenbury completed the working drawings and specifications in 1966. He designed the furniture and built-ins, adapted from the original plans created by Wright before his death. 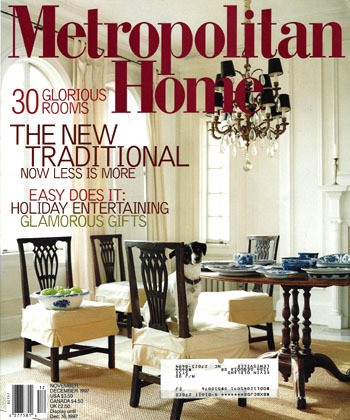 The round Dining Room table is on the left. A small round end table is in the center. A hassock and coffee table is on the right. Photographed by Neil Koppes. Published in "Phoenix", July 1970, p.55. 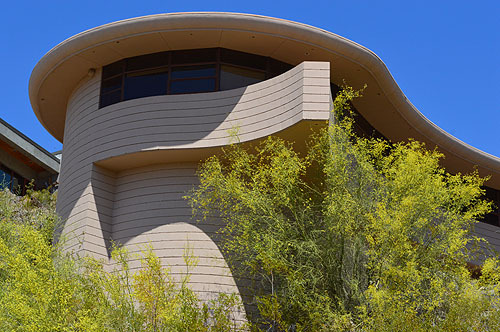 See our Wright Study on the Lykes Residence. Size: 10 x 7.5 Color photograph. Description: The renovation of the Lykes Residence, Phoenix. "Renovating Frank Lloyd (W)right. It Took More than Slavish Historicism to Update a Phoenix Masterpiece. 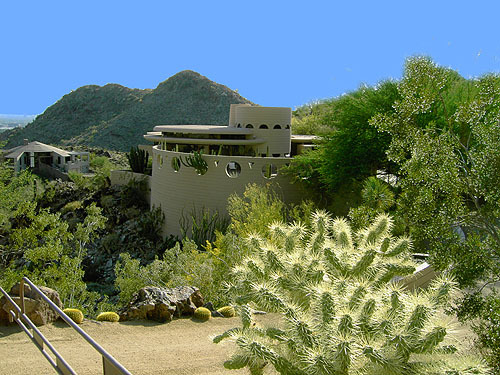 When Linda Melton bought this Frank Lloyd Wright house, its floors were covered in chartreuse shag: its woodwork was speckled with cigarette burns; its exterior was a shade of orange so unsubtle, �you could see it from the airport 12 miles away.� Three years later, it is an astonishingly skilled composition, a homage in the key of Wright..." Includes 19 photographs by Tim Street-Porter, and one illustration. Original cover price $3.50. See our Wright Study on the Lykes Residence.